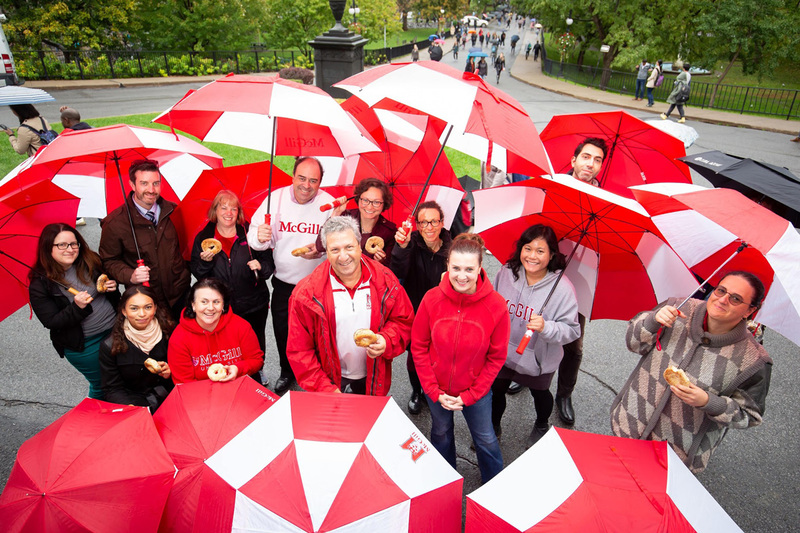 Undaunted by the rain, cheery members of the McGill community, carrying red and white umbrellas, gathered in front of the Arts Building, in support of Centraide McGill. The March of the Umbrellas launches the annual Centraide fundraising campaign. McGill’s Centraide Campaign 2018 runs until the end of December, with a fund raising target of $500,000. Eyal Baruch, a McGill Centraide veteran, brought bagels for the troops. Baruch is organizing badminton and ping pong tournaments to support Centraide in Athletics, where he is Facilities Manager. “It’s a great cause,” says Dilson Rassier, Co-Chair of the McGill Centraide Campaign, and Dean of the Faculty of Education. “Centraide funds 350 organizations that help one in seven people across Montreal. 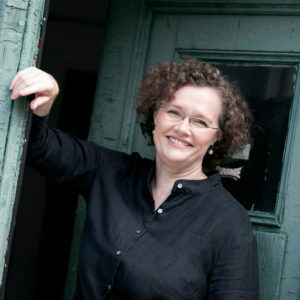 Centraide keeps administrative costs low, so donations go directly to meet the needs of families and individuals.” Edyta Rogowska, Secretary-General of McGill, is the other Co-Chair of the McGill Centraide Campaign. Rassier and Rogowska lead the McGill Centraide Committee, a 23-member group comprised of representatives from across the University, including Tre Mansdoerfer, President of the Students’ Society McGill University. McGill’s contingent went off to join some 20,000 other marchers, from all manner of public and private organizations and institutions, at Place du Canada. The March of the Umbrellas ends at the Quartier des Spectacles. From now until the end of December there will be a host of activities all over campus, organized by McGill’s 25 member Centraide Committee. There will be Trivia Games, Bake Sales, Pop Up Shops, and 50/50 Draws (everyone makes a donation-half the pot goes to Centraide and the other half to the winner), to name but a few. Members of the McGill community will also be receiving information about contributing to Centraide via automatic payroll deductions – one of the easiest and most convenient ways to support Centraide. For $50, 10 seniors receive a hot meal at home. For $100, a teenager is guided by a mentor for six months. For $365, 14 newly arrived immigrant families receive personalized support and followup. For more information you can email the McGill campaign organizers at centraide2018@mcgill.ca.